and Lucian Freud’s Ib and her husband, (1992). Lucian Freud’s Ib and her husband, (1992). Early works by Pop icons Andy Warhol and Roy Lichtenstein lead the evening auction and are joined by a central group of the next-generation of American artists including Felix Gonzalez-Torres, Mike Kelley, Glenn Ligon, and Kelley Walker. A major highlight of the sale will be a capsule selection of works by Jean-Michel Basquiat from the collection of celebrated actor Johnny Depp. Giants of European painting feature firmly with Gerhard Richter’s Abstraktes Bild (811-2) leading the line-up of modern masters. Two Dollar Bills (1962; Estimate: £4,000,000-6,000,000) stands in his oeuvre as amongst the very first silkscreens that Warhol ever produced, initiating the iconic serial method that would dominate his art for the next 25 years. Executed between March and April 1962, the work is based on drawings Warhol made on acetate, the series consisted largely of single images of the front or back of one- or two-dollar bills. Two Dollar Bills is among the largest of only 10 that were made in serial or group format, two others of which are held in the renowned international collections of the Museum Ludwig, Cologne, and the Staatliche Museen zu Berlin. The present work is the only frontal group of two-dollar bills in existence. Roy Lichtenstein’s Mustard on White (1963; Estimate: £1,000,000-1,500,000) is his first work on Plexiglass, and was originally owned by the legendary American collectors Victor and Sally Ganz. Executed in 1963 the work is inspired by 1960s diner culture and takes its place in a series of fewer than 15 paintings executed between 1961-63 depicting quotidian comestibles – hot dogs, cherry pies, Swiss cheese, coffee and ice-cream soda. Both works have most recently been held in museums and are early high-points in each artists’ signature techniques. Another highlight of the auction, Christie’s will present a time-capsule group of nine works by Jean-Michel Basquiat from the collection of the celebrated actor, producer and musician Johnny Depp. This carefully curated selection of Basquiat paintings and drawings attests to Depp’s understanding and engagement with one of the most acclaimed icons of 20th-century painting. Having been in dialogue with Johnny Depp since the start of the year, and following momentum in the Basquiat market since the auction record-breaking success of Untitled (1982) in May, this group of works from the early 1980s are set to be a focal point of both the Post-War and Contemporary Art Evening and Day Auctions. Depp has described his relationship with Basquiat’s work: "Nothing can replace the warmth and immediacy of Basquiat's poetry, or the absolute questions and truths that he delivered. The beautiful and disturbing music of his paintings, the cacophony of his silence that attacks our senses, will live far beyond our breath." Published in E. Navarra, Jean-Michel Basquiat, Paris 2000, pp. 16-17. Assembled over the course of more than 25 years, the works date, almost exclusively, from 1981: the year that saw Basquiat’s transformation from clandestine street artist to global superstar. Channelling the creative energy that fuelled the musical and artistic underbelly of post-punk New York, the works give a glimpse into this meteoric period in Basquiat’s career. Together, they bear witness to the birth of a revolutionary visual language – gestures, words and symbols – that characterised Basquiat’s work at the height of his career in 1981 and 1982. Widely exhibited in many of the artist’s most important retrospectives, they stand together as a survey of the moment that launched Basquiat’s stratospheric career. Since the 1990s, Depp has cultivated a detailed appreciation of Basquiat’s works, seeking out pieces that resonate with his understanding of the artist. 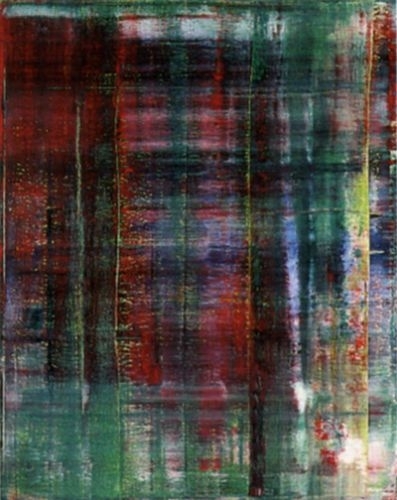 Abstraktes Bild (811-2), (1994, Estimate on Request) sliding wet paint into wet paint to create streaks of rich marbling and blooming chromatic fusion. Initially established as flat layers of paint, cavities and canyons melt away to reveal kaleidoscopic fissures of teal, emerald and burgundy; gleaming swathes of tonal contrast create a sense of depth and time in the work’s successive levels, the eye tripping off the material as it descends to a hand-painted stratum beneath, with iridescent echoes of the aurora borealis or of dark European pine forests. A trio of sharp- edged bands gleam lime green at their edges, betraying the trace of the artist’s unmistakable squeegee technique, which he famously employed to remove the artist’s hand from his compositions. This method was to find its purest articulation between 1989 and 1994 with large-format paintings such as Abstraktes Bild 811-2. Deconstructing the relationship between figure and ground, Richter embraced the contingency of his medium, enjoying the chance effects of his confident application of paint.